Google Fit meets Android Wear gaming in Google's new game sample Games in Motion. It's an intriguing effort to get developers away from porting simple smartphone games to smartwatches. With a Zombies, Run! style mechanic, using onscreen alerts as well as text to speech audio, the game gives you fictional incentives to speed up as you're jogging, for instance. It takes activity tracking from your Android Wear watch and integrates that into the story with the description saying it aims to "give players good motivation to exercise". Various scenarios - from being a spy to a zombie chase - play out with multiple choice options depending on the activity data coming through to Google Fit. 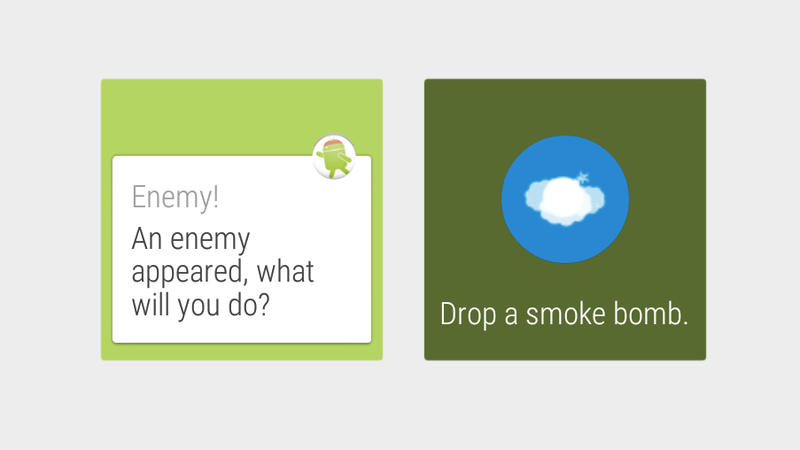 Google posted a few screenshots showing a running mission with time, distance and pace info as well as cards asking what to do about an enemy and an instruction to drop a smoke bomb. This is pure background gaming which relies on your imagination as you run, no mean feat to get right, but it's something we've seen in a less fitness focused way for the Apple Watch in the form of Bossa Studios' Spy_Watch game. Like Spy_Watch, Games in Motion lends itself to smartwatches as the interactions last seconds rather than minutes and play out over the course of your run. Games in Motion is open source and up on GitHub for developers to play around with - we could see some interesting uses which blend real life workouts with in-game fictions.